On this day 123 years ago, Jack the Ripper claimed his first victim. But who was this serial killer? This new e-fit finally puts a face to Carl Feigenbaum, a key suspect from Germany. 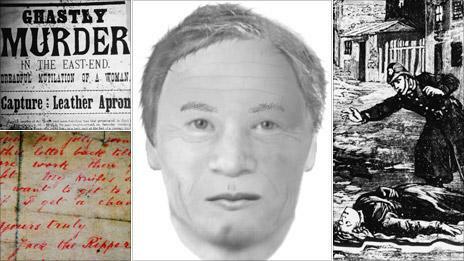 Jack the Ripper is the world's most famous cold case - the identity of the man who brutally murdered five women in London's East End in autumn 1888 remains a mystery. Convicted of murdering his landlady in Manhattan, Feigenbaum died in the electric chair in New York's Sing Sing prison in 1894. His lawyer suspected him of the Ripper murders too. No photos of Feigenbaum exist. So Marriott has produced this new e-fit for BBC One's National Treasures Live, created from the description on the admittance form when he was in prison on remand in New York. Why does Marriott think Feigenbaum is Jack the Ripper? Evidence, in the form of police documents and hundreds of letters to the authorities and newspapers, give us some clues. Age 54. Complexion med[ium]. Eyes grey. Hair dark brown. Stature 5ft 4 1/2. Weight 126 [pounds, 57kg]. Medium sized head, hat 6 7/8 or 7. Shoes 8. Hair grows thin on top of head. Small slim neck. Eyes small and deep-set. Eyebrows curved. Forehead high and heavily arched. Nose large, red and has raw pimples. Teeth poor + nearly all gone on left sides. Anchor in india ink on right hand at base of thumb and first finger. Round scar or birthmark on right leg below left knee. The assumption has long been that Jack must have had anatomical knowledge because of the skill with which his victims' organs were removed. But it's possible these were cut out in the mortuary, rather than by Jack at the scene. The 1832 Anatomy Act made it legal for medical personnel to remove organs for training purposes. This theory is supported by documents on the fourth victim, Catherine Eddowes. The inquest report shows only 14 minutes elapsed from the time the police did their last sweep of the square in which she was killed and her body being discovered. Was this really enough time for someone to have killed Eddowes, removed her uterus with surgical precision, and all in near complete blackness? Regardless of one's medical knowledge, this seems a stretch. So Marriott believes Jack wasn't necessarily a surgeon after all. He began to investigate other groups who might have been in the area. St Katharine and the London Docks are a short walk from Whitechapel, a place merchant seamen would have flocked to as it was an infamous red light district. Such close proximity would have made it easy for the killer to steal back to his ship unnoticed. The gaps between the murders also suggest the killer may have been a traveller. This theory fits with other facts, too. Although some suggest the killer was a resident of Whitechapel, wouldn't locals have given him up to the police? Especially after a reward was offered. After some digging, Marriott came across records which showed the Nord Deutsche Line, a German merchant vessel group, had a ship called the Reiher docked at the time of the murders. 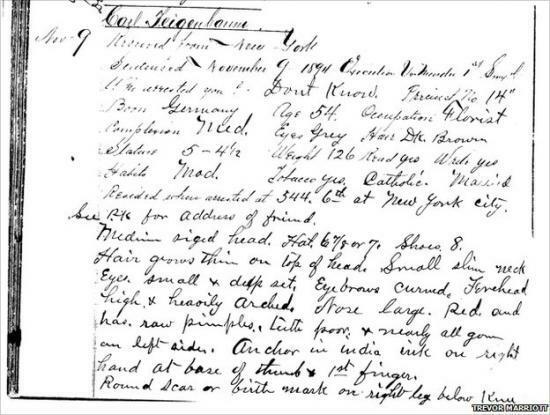 When Marriott investigated the seamen aboard this ship, he came across the convicted murderer Feigenbaum. Having watched his client die in the electric chair, Feigenbaum's lawyer William Lawton told the press he believed him to be responsible for the Ripper murders in London. Feigenbaum had confessed, he said, to suffering from a disease which periodically drove him to murder and mutilate women. What was this disease which made him undertake such brutal acts? Today, a psychiatrist is likely to describe it as a psychotic episode. Fortunately, few people with psychotic tendencies go on to become serial killers, but those who do gain an infamy matched by no other crime. 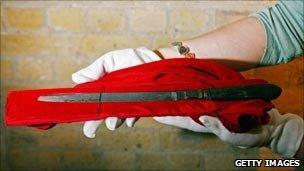 The Jack the Ripper murders provoked a nationwide panic whipped up by press sensationalism. Violence, especially violence with a sexual frisson, sold newspapers. But violent crime never figured significantly in the statistics or in the courts. By the late 19th Century, developments in psychiatry and the popularity of social Darwinism led to "the criminal classes" being identified as individuals suffering from some form of behavioural abnormality, either inherited or nurtured by dissolute and feckless parents. This informed the way they were treated by the criminal justice system. 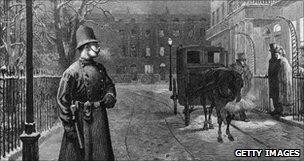 The English police took the prevention of crime as their watchword. The assumption was that the unskilled, working class constable, patrolling his beat at a regulation two and a half miles an hour, would deter offenders. At the time, everyone believed all five women had been killed by the same man. But having reviewed the evidence, Elizabeth Stride may have died at the hands of another killer, as everything about her murder is different to the others. "Firstly the time the murder took place, and the knife used to cut her throat was much smaller than all of the other victims, hence the knife wound to her throat was much smaller and she had no other mutilations," says Marriott. "The location was different to all of the others. The murder was right by the side of a workers' club which was packed with men at the time." And now a serious question mark hangs over the death of Mary Kelly too. "Fresh material has come to light which may suggest she was not Mary Kelly but someone else," says Marriott. "If that is the case, there is a motive and likely suspects for her murder." As a forensic anthropologist, to review the ultimate cold case is a privilege. Initially, I thought Carl Feigenbaum was that serial killer. His profile fit. But further evidence, outlined above, may show these murders were not all committed by the same person. Feigenbaum could have been responsible for one, some or perhaps all. We have shed new light on this old case. But it is certainly not solved, and this dark tale has many more secrets to give up before we know, for sure, the name of the man we call Jack the Ripper.